It's hard to keep a secret bar secret these days. Even speakeasies seem to have public relations teams. So it's refreshing when we come upon a bar that isn't open, won't let you in and may not actually be a bar. Introducing Woodson and Ford, destined to become the next great underground scene, now open (sort of) in Noho. Officially only open for private events or for those with the password (hint: it's not fidelio), it's going to take a little work to get in (easy way: book a private party). 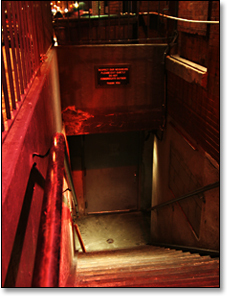 But once you make it down the stairwell, past the bouncer and through the unmarked basement door (pictured above), you'll find yourself in an absolute stunner of a dimly lit old-world drinking spot—three rooms lit by Edison bulbs and black chandeliers, stocked with antique British furniture and lorded over by a grand piano, not to mention a secluded parlor room perfect for that secret society you've been putting together. The space supposedly also has a bit of history as a photo studio where Abe Lincoln was shot (not like that), a brothel where two prostitutes had their throats slit and a pub where Walt Whitman and Mark Twain hung out. Which means it's the perfect place to cozy up amongst the taxidermy, sip on Death & Co.-style cocktails like the Woodrow Wilson (rye, amaro, champagne, orange zest) and ponder your place in history. Or just your next drink.